We are providing a wide array of Metal Bellows Coupling that are widely used for a wide range of applications. These Metal Bellows Coupling has significant characteristics like backlash-free transmission of torque, high torsional stiffness and excellent compensation of angular, axial and radial misalignments. 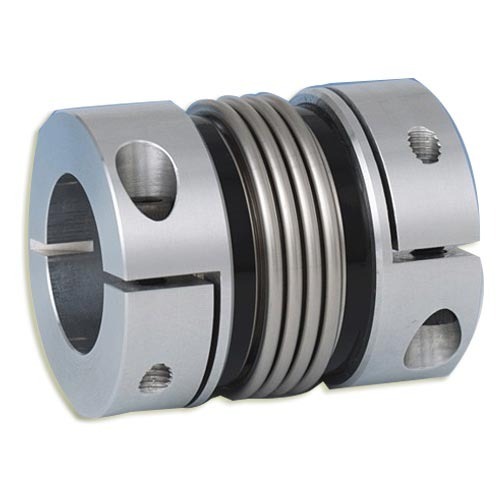 Further these coupling are offered by us in various specifications at the most competitive prices. Hindusthan Industries was established in 1973 as a Partnership Concern with Mr. Srikanta Mandal at West Bengal. We are one of the leading manufacturer, supplier and exporter of a vast variety of Labyrinth Ring, Spacer Ring, Industrial Bush, Gear Coupling, Bellows Coupling, Industrial Torque Limiter, Universal Head, Bearing Chock, Block Bearing, Spindle Head, Wobbler Sprinkler, Pinion Gear, Gear Wheel, Industrial Shaft, Tools Holder, Boring Stand and Industrial Sprocket. Our products are the best choice of various leading companies of the market due to our high quality products, standards and designs.We customize these products for our esteemed customers as per their specific needs and requirements.